The indie platformer can now be purchased on the PlayStation Network and comes with cross play functionality. Do you like jumping? Do you like rectangles? If you said yes, the PS3 and Vita may now be sporting a game in line with your hop happy, right-angle loving personality. Thomas Was Alone, originally made by game designer Mike Bithell, is now available for purchase on the PlayStation Network for $9.99. The PS3 and Vita versions will be faithful to the original game that Bithell "made over a weekend because my girlfriend was away and I was a bit bored." That said, it will also include some nice extras that newcomers and existing fans should both be able to appreciate. "This version will also give you first access to some new stuff," said Bithell. "There's a new DLC episode which tells the story of Benjamin, a new square with a jetpack and big ideas, and a commentary mode in the main game where you can listen to me going on and on about how clever I was putting the game together." 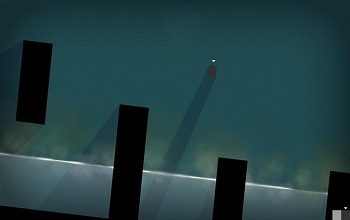 Bithell expressed amazement over the progression of Thomas Was Alone, originally a Flash title, and gratitude to the parties that helped him bring it to the PlayStation Network. "I'd very much like to take this opportunity to thank Curve Studios, who made this version of the game. They did a great job, and it plays really nicely. They are better coders than I am." He also thanked Sony which he praised for its efforts to bring more indie developers and games into the PlayStation fold. "Sony is a mega corporation; a big goliath of awesome tech and excellent button iconography. And for some reason, known best to themselves, they decided they wanted to let us indies play with their toys. Thomas is one of a massive wave of upcoming indie titles, which I hope will find whole new audiences." This forthcoming wave of indie titles includes games like Hotline Miami and Lone Survivor, both of which will be seeing ports to Sony hardware. Like Thomas Was Alone, Hotline Miami and Lone Survivor will boast cross buy functionality, allowing gamers to buy one version and enjoy it on both the PS3 and Vita.